Xiaomi Redmi Note 7 is in the news from past several months, due to several leaks and gossips. Xiaomi is Furthermore actively working to promote the gadget by teasing it via alternative means. Whenever teasing its various colour features and other details, the Chinese manufacturer took to Twitter to compete against the newly launched Samsung Galaxy M series. It is obvious, as the recently unveiled Samsung Galaxy M series is a potential competitor for Redmi Note 7. In the recent past, Xiaomi has been continuously mocking the Galaxy ‘M’ in different ways. Until currently, Xiaomi hasn’t explicitly titled Galaxy M20 device, they have been using the word ‘M’ in all the teasers. The scenario is making us believe that they are mocking Galaxy M series products. 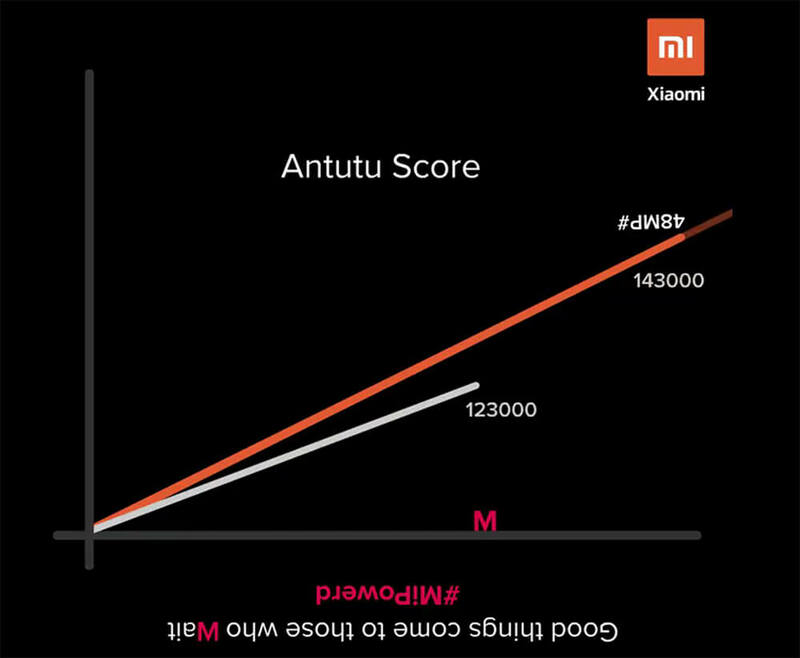 Although making assumptions more firm, Xiaomi specifically posted the AnTuTu scores of Galaxy M series smartphone and Redmi Note 7. The teaser reveals that the Redmi Note 7 scores Quite well against the competitor aka. Galaxy M series product. In the teaser, Redmi Note 7 managed to enjoy 143,000 points against the 123,000 points of M branded device. Additionally, Xiaomi Redmi Note 7 is already launched in China for 999 yuan ($148) with a 48-megapixel primary rear digital camera. For selfies, Xiaomi has added a 13-megapixel front camera. There’s also a standard 6.3-inch FHD+ display having a resolution of 1080 x 2340 pixels. The panel is protected with a Corning Gorilla Glass 5. There’s a 3/4/6GB RAM coupled with Qualcomm Sd 660 SoC. It is in the world in 32/64GB internal memory alongside with the expandable memory setup of upto 256GB via microSD card. Moreover, Xiaomi is also planning to launch the Redmi Note 7 Pro in China quite soon. It will function much-improved specs than the Redmi Note 7. It will have a better 48 MP image sensor module, 128GB storage, and a gradient color option. Xiaomi India is expected to price the Redmi Note 7 for about INR 10000. As per old leaks, it is supposed to make a first public appearance in India on Febraury 12th. So, let’s wait for a number of extra days before hypothesizing anything else.